UPDATED: FEB 27, 2019 27.02.2019 -- 0.33l bottle from qoqa, 03.08.2018-13.08.2019. pours a slightly hazy golden with a huge frothy head. aroma of grapefruit, spruce, soap, slight flowers. flavour of minerals, soap, citrus zest. light body. quite soapy, otherwise ok. 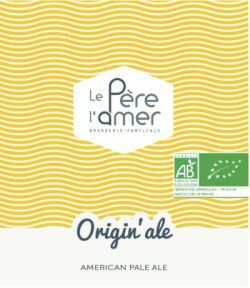 UPDATED: FEB 27, 2019 Tap at Le Garde Fou. Bit hazy light golden with white head. Pils malts, soft wheat, light grapefruit, CO2, soft weedy notes and light gooseberries. Chalky. Just medium sweet and bitter. Almost medium bodied and a bit dry feel. UPDATED: JAN 25, 2019 Bottle. Pours unclear amber. Aroma is dust, citric and tropical fruit, floral, yet all a but too phenolic. Body is light, thinnish, low carbonation, low sweetness and bitterness. Kinda works, not well.